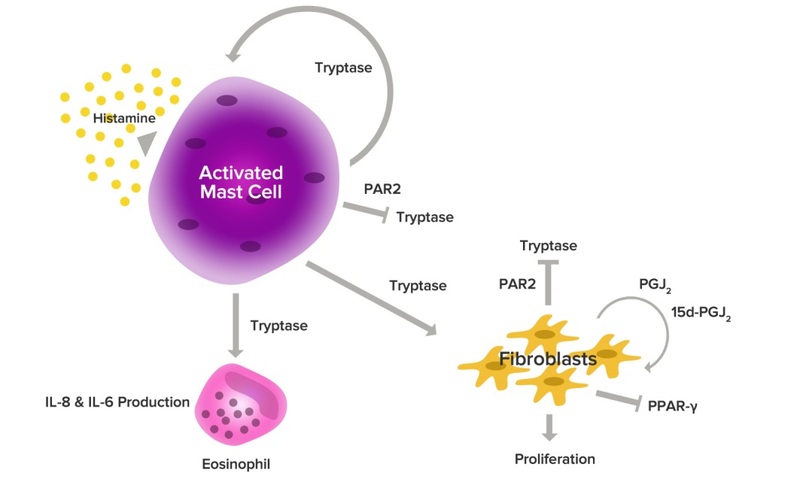 Mast cells play a critical role in normal immune function and respond to antigen stimuli by releasing mediators such as histamine, leukotrienes, and tryptase. Histamine and leukotrienes are well known for their role in air-borne environmental exposure reactions. Tryptase (also commonly referred to as mast cell tryptase, mast cell protease II, mast cell neutral proteinase and tryptase M) is released in the same response. Blood tryptase levels can indicate whether or not mast cells are activating appropriately and also as a measure of the number of mast cells in the body. When the body is not responding to environmental exposures the level of tryptase in the blood is very low and in contrast, tryptase levels will be high when there is either mast cell activation or increased mast cells in the body1. When there are increased numbers of mast cells, studies have shown that higher tryptase levels lead to more pronounced reactions to environmental exposures. Anrooij reported that increased mast cell load provided supportive functions for a specific non-airborne exposure2. Mast cell stabilization through tryptase inhibition is a mechanism to consider in providing seasonal support patients. 2Anrooij, B, Veer, E, Monchy, J, et al. Higher mast cell load decreases the risk of Hymenoptera venom–induced anaphylaxis in patients with mastocytosis. Journal of Allergy and Clinical Immunology. 2013: 132(1): 125-30.